Reprinted from Fox News. A great perspective for everyone… especially the skeptic. On Monday something will happen in the U.S. that should startle — or at least perplex — anyone who gives it any thought. I am referring to the full solar eclipse you may already be anticipating. To be clear, thinking about what is about to happen has little to do with the sheer visceral experience of being amazed by it, as we must be. Before thinking about it, we should perhaps first simply goggle at it, at the monumental majesty of these monstrously large heavenly orbs, both of which we typically take mostly for granted. Is it not remarkable that these ever-present objects — though separated by nearly one hundred million miles — should once in a very great while perform this curiously perfect dance? But to what end? So this sort of thing doesn’t happen anywhere else in our solar system. But our planet has just one moon that happens to be just the right size and just the right distance from Earth. But what might make us start to think a bit about this event is that this celestial pas de deux is being performed only for us. Anywhere but here on this planet on Monday, the view of these two objects is nothing special. It is only what we see from our terrestrial vantage point that is special. It’s almost as though what we will marvel at was artfully arranged specifically for our benefit. Which brings us to the curious and startling part of the story. About fifteen years ago an odd idea popped into my head. Google was just a gurgling infant. But I happened to have a sturdy Brittanica nearby and I pulled out a dusty volume and quickly discovered the diameter of the sun. It is precisely 864,576 miles. The diameter of the moon was listed at 2,159 miles. I then looked up the distance from Earth to the sun, which varies slightly, but is generally given as 93 million miles. And then I found the distance from Earth to the moon. That varies slightly too, so the average is given as 239,000 miles. Armed with these four figures, I did some simple math. I divided the sun’s diameter (864,576) by the moon’s (2,159) and got 400.452. If my strange hunch was correct, dividing the distance from the Earth to the sun (93,000,000) by the distance from the Earth to the moon (239,000) should give me something similar. It certainly did. My calculations yielded 389.121. And there it was. I stared at the numbers, amazed. Was the correlation in these ratios mere coincidence? Of course what this all meant was simply that these immemorially ancient and vast objects, though as different in size as a single BB and a super gigantic beach ball — one that was over six feet in diameter — would from our perspective here on Earth seem almost precisely the same size. So if they ever just happened to align in the sky, they would match up perfectly. Not almost perfectly. But perfectly, and bizarrely so. What might be the odds of this just happening randomly? Almost all the planets in our solar system have no moons or many moons (Jupiter has 60) of incredibly varying sizes. So this sort of thing doesn’t happen anywhere else in our solar system. But our planet has just one moon that happens to be just the right size and just the right distance from Earth. I found the precision necessary for all of this unbelievable. The more I thought about it, the more I knew that there was no way this could be a mere coincidence. It seemed almost planned. In fact, it seemed utterly planned, as all things of such precision must be. To bring this closer to home, imagine holding a BB twelve inches from our face and then asking a friend to carry the six-foot diameter beach ball as far down the beach as necessary — until it appeared precisely the same size from our perspective as the tiny BB. Keep in mind our beach ball is six-feet in diameter while a normal large beach ball is less than two feet in diameter. Our friend would have to hike 400 feet before the giant beach ball and the tiny BB matched up in size. That’s about the distance from home plate to the centerfield fence in most major league baseball stadiums. So can the sun’s and moon’s diameters — and distances from Earth — be merely coincidentally matched up this perfectly? Everything about it makes that seem ridiculous. But of course you can decide for yourself. 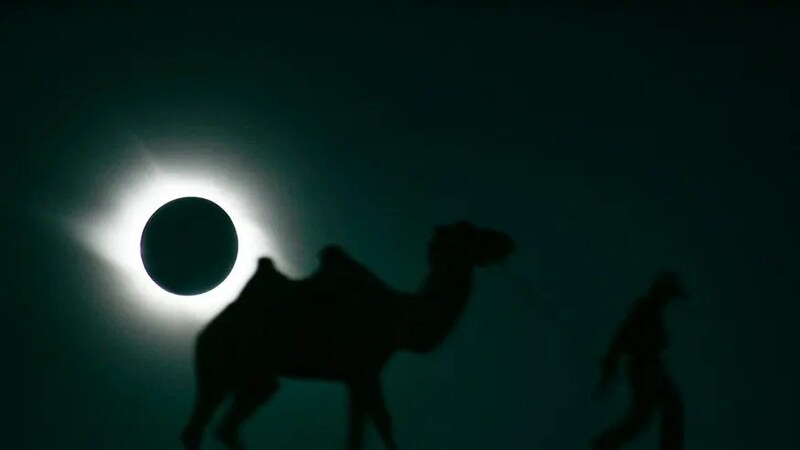 Three thousand years ago a man in Israel wrote: “The heavens declare the glory of God; the skies proclaim the work of his hands.” That man didn’t have a telescope or a Brittanica, but he saw something many of us today still do not see. He saw a God behind it all. It may be true that seeing a Grand Designer behind these breath-taking events requires what we call a leap of faith; but it may also be true that seeing mere coincidence behind them requires an even greater leap of faith. In my mind, much greater. But on Monday, you may be the judge. Eric Metaxas is the author of several bestselling books, including “Bonhoeffer” and “Amazing Grace.” His latest book is “If You Can Keep It: The Forgotten Promise of American Liberty” (Viking, June 14, 2016). Excellent! Love the BB/giant beach ball down the beach 400′ from each other. For more watch DVD The Privileged Planet: How Our Place in the Cosmos is Designed for Discovery by Guillermo Gonzalez.